As a Spanish and International Affairs major, travel, global politics, and reading have always been of interest to me. Fortunately, our Archives & Rare Books Library contains an extensive collection on early exploration and travel accounts. Just having recently returned from Spain, I want to focus this blog on a few of the Spanish-centered accounts. For most people, Spanish history is often minimized to a few events: Christopher Columbus’ discovery of the Americas and the dictatorship under Franco. Because of this, I want to highlight other important centuries of Spanish history while pulling some illustrations and details from our various books. Spanish history is full of wars amongst powerful nations (Roman, Moorish), famous people (Seneca, Trajan), and important discoveries (antiseptics, modern surgery). Owning Spain was important to trading, resource extraction, and crucial routes between Europe and Africa. One such empire that realized the value of Spain and would hold power of the area for centuries was Rome. 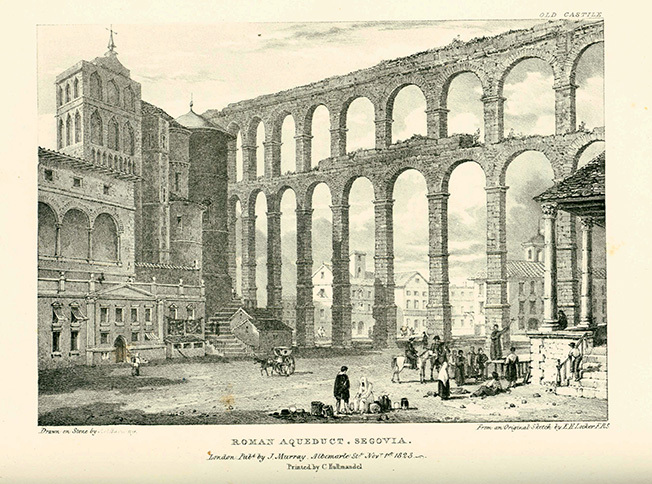 To this day, the Roman impact on Spain is still evident: Segovian Aqueduct as illustrated in Edward Locker’s Views of Spain (1824) continues to provide water; Roman law; Christianity; the Romance language of Spanish; and the prevalence of olive oil and wine in the cuisine. Following Roman rule, the Moors from North Africa arrived and claimed land in the southern peninsula. From the architecture to the language, and even the agriculture, the Moors shaped a significant part of Spain’s history much like Rome. The exquisite palace, Alcazar of Seville, remains one of the greatest and most beautiful examples of Islamic architecture. The same architectural style can also be seen in the Great Mosque of Cordoba. 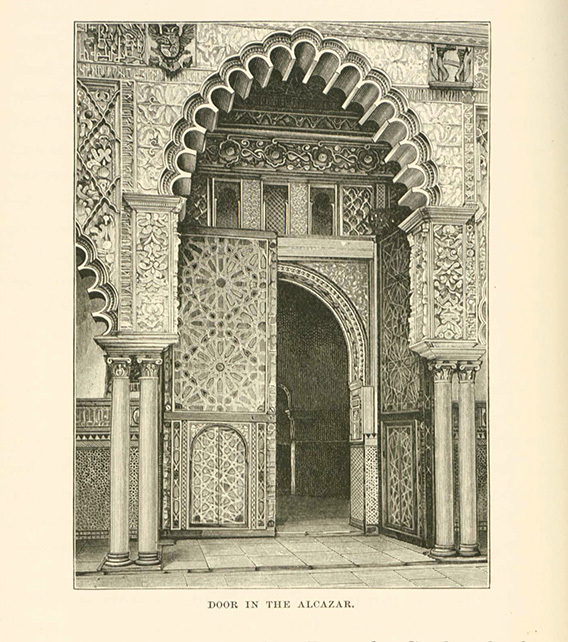 S. P. Scott’s Through Spain: A Narrative of Travel and Adventure in the Peninsula (1886) highlights the impressive beauty of the Alcazar and the Mosque. 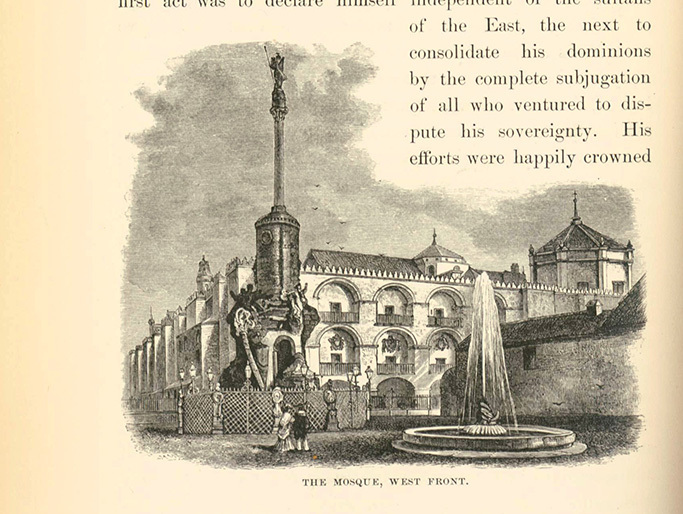 During the Middle Ages, both types of architecture (Roman and Moorish) alongside newer styles from the ruling Hapsburgs or Bourbons would create iconic cathedrals, palaces, and public buildings. One example of this mixture of architectural styles is the La Seo Cathedral in Zaragoza. 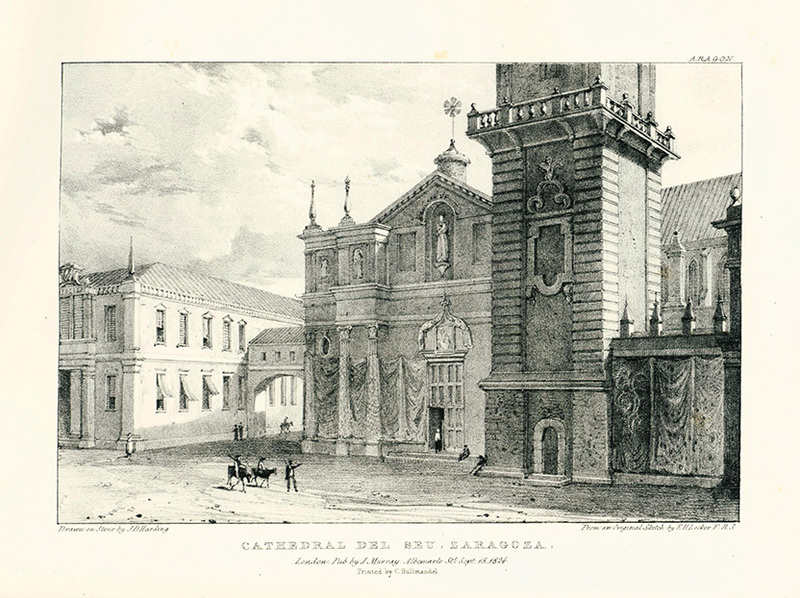 Although it is hard to see in the stone etching of the cathedral from Locker’s Views of Spain (1824), the structure contains a Romanesque apse, a Baroque tower, Mudejar exterior walls, and a Gothic altarpiece. The conglomeration of multiple styles illustrates the diverse and rich history of Spain and highlights the acceptance of cultural differences that was evident throughout much of the nation’s history – minus a few dark periods, of course. For more information about early exploration of Spain or other travel accounts, visit the Archives & Rare Books Library on the 8th floor of Blegen Library. We are open Monday through Friday, 8:00 am-5:00 pm. You can also call us at 513.556.1959, email us at archives@ucmail.uc.edu, visit us on the web at. http://www.libraries.uc.edu/arb.html, or have a look at our Facebook page, https://www.facebook.com/ArchivesRareBooksLibraryUniversityOfCincinnati.